It is November, which means time to tidy up outdoors before the snow falls. This weekend I put away the hoses, stashed the kayak in the basement, put up bird feeders, started moving the compost from one bin to another, and several other winterizing tasks. I also emptied the birdhouses. This summer we were lucky to have three bird species nesting at the same time, using all four of our bird houses. 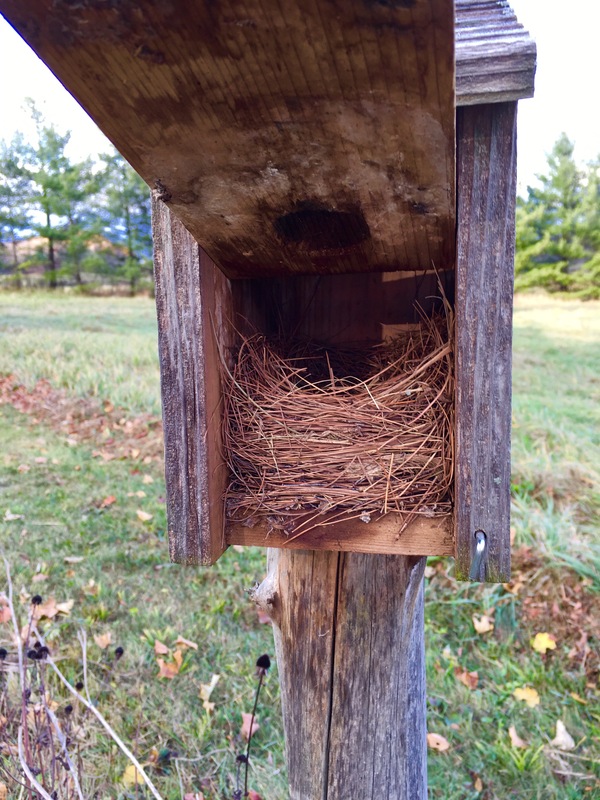 Eastern Bluebirds occupied two of the boxes, Tree Swallows shacked up in a third, and House Wrens built a nest in the fourth. Things were active. I cleaned the boxes out in hopes that they would again be attractive spaces for nesting when the birds return next spring. The bluebirds liked the two boxes that are closest to a big maple tree. They like to hop up into the tree and to perch on top of the boxes, back and forth. The swallows prefer the one that is most open, accessible to the open field for their insect foraging. The wrens like to be close to cover, so the nesting box next to the Norway Spruce was just right for them. The boxes are built with hinged front panels, so they are easy to open. When the panel is closed they are open only at the round entrance hole, the bird doorway if you will. With the panel swung open, however, it is easy to pull those nests out and do some general cleaning up. I started with the wren nest, which was made of twigs with a softer inner layer of grass and feathers. The swallow nest was compact, made mostly of grass, and covered in bird droppings, which seemed unusual. 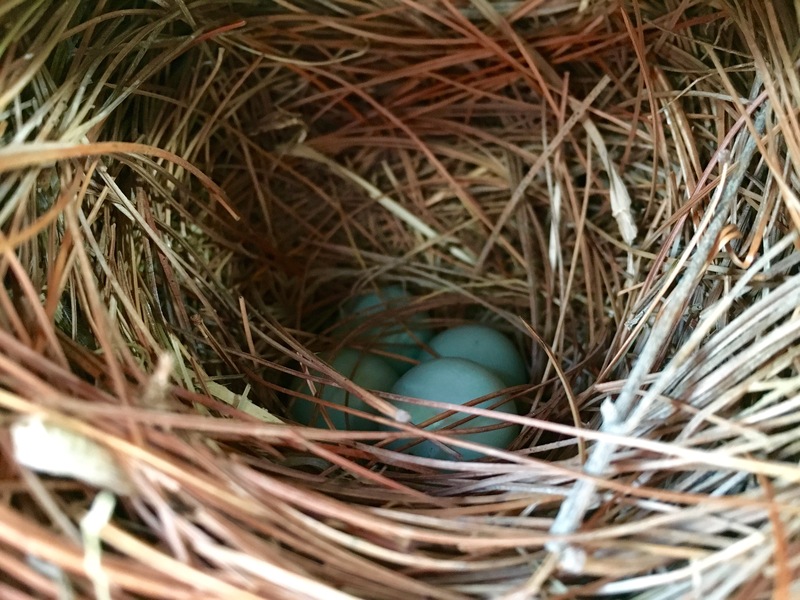 The bluebird nests were made almost exclusively of pine needles. 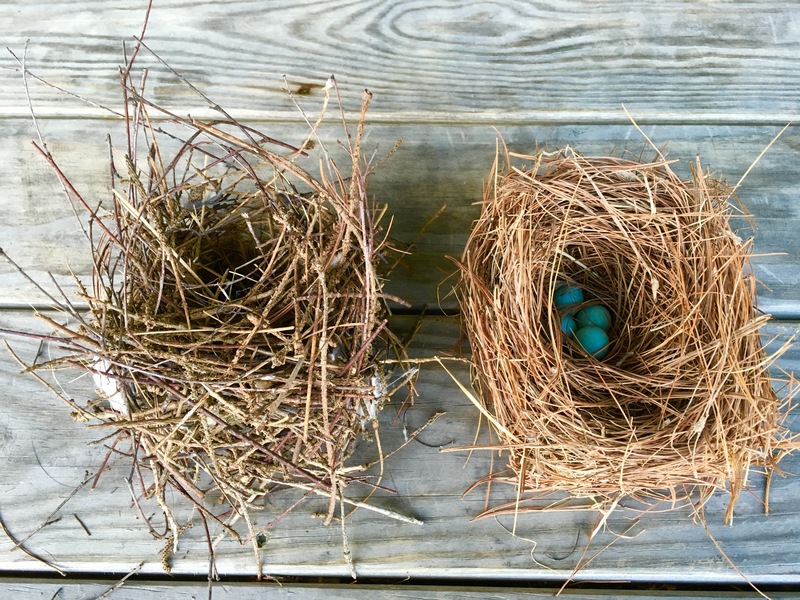 The odd thing about the bluebird nests was that they each had eggs in them–two in one nest and four in the other. They were clearly abandoned. My guess is that the bluebirds had one successful clutch, then laid another set of eggs too late. The eggs were pretty cool to see. It is a little sad, to anthropomorphize a little here, to see all that potential life never to be realized sitting in snug little packages. Those little blue orbs could have been bluebirds that flew to Florida or Mexico and then returned to build their own nests. Only humans really care about such things though. The bluebirds do what they can. If the eggs don’t hatch, they simply try again next year. I guess flying up to 2,000 miles twice each year is enough to worry about. I didn’t scrub the boxes out with soap, as some people do, but I hope our birdhouses are clean enough to be welcoming to next year’s birds. This was the first year that House Wrens nested in one of our boxes, so that was a treat. I hope they decide to stay with us again. Of course, the same goes for the bluebirds and swallows. We may need to open up another box or two, expand the whole operation. We certainly have plenty of room, and waking to the crazy burbling and whistling and chirping of spring birds is well worth a half hour of November housekeeping. I had a basic cleaning at my dentist yesterday. That is a common thing for many people, myself included. Yesterday’s visit had several things of note, however. I had to reschedule my original appointment from early May to a different day so I wasn’t even in the same room. The usual pattern wasn’t happening. I planned ahead this time. I don’t usually have to wait all that long at my dentist’s office but occasionally it happens. To keep myself free of things I might forget I usually plan to read whatever magazines happen to be there. I can typically find your standard news magazines–Newsweek, Time and the like–and there is always something different to check out, but this time I brought some to share. I am an Orion reader and it is simply one of the best magazines I have ever read. It is interesting and engaging and just plain interesting. I remembered to bring the last couple of issues to leave behind for others to read. I also brought the latest issue of Mother Jones. So I was ahead before I headed to the chair with the headrest. I was ushered to a room that is not my usual room, the room where they usually perform the big jobs–fillings and drilling and shots to numb things up. I was afraid they had made some kind of mistake. But phew, it was just because of the appointment rescheduling and associated space issues. Then the hygienist who usually gets things started was not there. I’ll have to wait a while six months to find out how her children finished up the school year. Too long, I tell you, too long. My dentist did the whole dang thing for me. He checked and cleaned and wrapped things up and off I went. He didn’t offer a rinse and spit, although it wasn’t necessary, and he didn’t floss my teeth. I kind of look forward to the flossing. It is a unique experience, having someone else floss one’s teeth. He did, at least, remember to give me a toothbrush. I had to confess to my dentist that I had come there directly from my son’s end of year school celebration. They served cupcakes. It seemed incongruous to be getting my teeth cleaned right after eating cupcakes. He was concerned less with my eating sugary snacks before an appointment than with my neglect to bring any of those treats to his office to share. Lesson learned: Next time, bring cupcakes to the dentist. I made another appointment before I left. I recently gave my dentist a D on Angie’s List for availability. Unless you have an appointment set up well in advance, forget it. I can’t even set up an appointment for six months out. I have to schedule it eight months out. I had done that last time, so I’ll be back in November (six months from my original appointment). I scheduled another one for May. What day works best for you? That was hard to answer. I’m not sure what day will work best for me a year from now. So I picked a week day for mid-morning. Hopefully I can schedule around that. I have extra clean teeth today. As long as I stay on top of it I should make it to November. Then I will get to find out how the new blueberry bushes fared, and if my dentist ended up taking that cooking class. Plus, I will finally get to find out how the hygienist’s kids are doing, one grade later. In the meantime I need to get through summer. I’ll have to make sure I watch it with the creemees. My daughter had the idea over dinner that we take a family walk down the road. When your kid asks to do something outside as a family, it is awfully hard to say no, even if you have your pajamas on unaccountably early and the hour has crept beyond the usual one for dinner. So I donned the jeans once more, slipped on mud boots with my children, and off we went. A month ago, the ditch lining the road was deep with ice. We would walk across with nary a step down. Now it is muddy, running with melted snow. The children tossed rocks, some of which made the hoped for splash, some of which stuck impressively into the mud. They stomped and squished. The shouted and laughed. We had a hard time getting them to turn around so we could get home for bed. We picked up a crazy amount of trash a few weeks ago, but there is more now. Some of it has peeked out from the ice or snow, but some of it is new. I can’t get over the amount of new litter to be found in those few weeks. I want to believe it is just an accident, that each new piece bounced from a truck bed my mistake, but there is too much of it. People are tossing that crap out the window. It can bring one down, seeing how someone cares little enough that they will leave it to others to pick up their empties. We generate enough trash as it is. Americans generate about 4.6 pounds of solid waste per day, per person, and only about a quarter of it gets recycled, even though we could recycle about 3/4 of it. A large percentage of that 4.6 pounds seems to wind up along the road. I picked up two aluminum cans this evening–one whole and filled with mud, the other squashed flat–and one flattened plastic bottle. I will recycle them. At least, I will take them to the transfer station to be recycled by someone else, but that is more than my untidy neighbor, whoever he or she might be. The kids are happy to help me clean things up. I guess they do understand the importance of cleaning up, even though they left a huge mess on the floor this evening before they went to bed (it got too late to push that one). They were dirty enough that I told them to leave the rest of the plastic bottles, half buried in the winter’s layer of sand, where they were. I can go get those later at some point. I had to do some boot rinsing when we got home. We were a tad muddy. I tossed what I was carrying into a blue recycling bin, cleaned some footwear, washed my hands, and headed to the kitchen to clean up that mess. Sometimes it feels like I spend my whole day cleaning up messes. But what fun would life be without messes, right? As soon as I am done here, I think I will pick up all the toys on the floor. I should probably make the kids clean up their own mess, but I need to be a nice guy once in a while. Maybe tonight will be that once. My wife was at a holiday party this evening so I was home with the children. 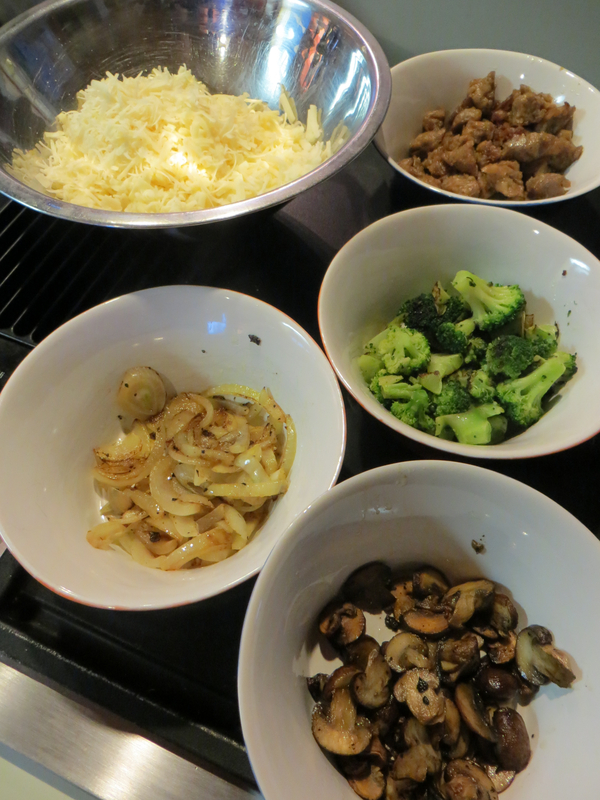 I made them dinner. We ate together. We toasted several things, including their mother. We missed her. I cleaned up. I asked them to be good to each other while I did so, and they did that. They took out some art supplies and worked with them. I came around the corner after cleaning, and listening with only one ear, to discover what they created. We have a funky ride on toy that they loop around the stairs on the wood floor. They love it. They decided to decorate it tonight. In case you can’t see it very clearly, we’ve got a montage of sea creatures and party clothes. How’s that for a mix?